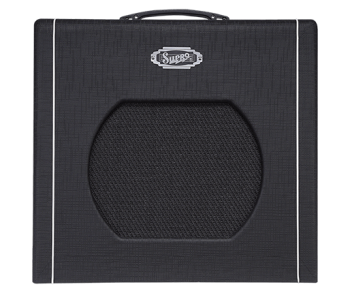 The Supro Blues King 12 combo amplifier captures the vintage Supro amp tone that helped sculpt the sound of early electric Rock & Roll and the British Invasion of the 1960s. The “single-ended” Class-A tube power amp found in the Blues King provides the raw tonal characteristics and remarkable touch sensitivity of these mid-century combos, while delivering a full 15 watts of 6L6 tube power. Front-end gain in the Blues King is supplied by a 12AX7 tube preamp and a FET-driven, fat boost function. In addition, the amp’s high-gain mode uses a series of cascaded FETs to achieve face-melting levels of distortion and sustain. 3-band EQ and Master Volume controls join the footswitchable boost and gain functions to provide multiple layers of stackable overdrive for gigging, recording and home practice. The Blues King features a custom-made genuine analog spring reverb, plus an effects loop for pedals and a line output for recording or feeding to another amplifier. The vintage-inspired poplar wood cabinetry is based on the mid-50’s Comet model and comes loaded with a BK12 speaker. This custom-made, 12” driver was specifically designed to capture the magic of the original field-coil speakers used in American tube amps at the dawn of the electric era.